This fresh and fun flan recipe comes from Meals & Memories, which supports High Country Hospice of Alleghany County. Preheat oven to 350°. Heat a large nonstick skillet over medium heat. Coat pan with cooking spray. Add corn, and cook 5 minutes or until tender. Set aside 1 cup corn kernels. Place remaining corn in a food processor; pulse 5 times or until coarsely chopped. Add milk and next 5 ingredients (through eggs) to food processor. Pulse 4 times or until combined. Pour about ½ cup corn mixture into each of 6 ramekins* coated with cooking spray. Place ramekins in a 9-inch x 13-inch baking pan. Add hot water to pan to a depth of 1 inch. Bake at 350° for 35 minutes or until the center barely moves when ramekins are touched. Remove ramekins from pan; cool 5 minutes on a wire rack. Invert flan onto each of 6 plates. Garnish each serving with about 2½ teaspoons corn kernels, 6 tomato halves, and 1 teaspoon basil. *This dish can also be made in one baking dish. Most of the recipes are familiar classics that mountain families have enjoyed for years, such as Louise Evans’s pickled eggs. Some of the recipes, such as Jane Wallace’s sweet corn and Parmesan flan, are fresh and fun. For the variety of recipes alone, Meals & Memories would have been a good seller. 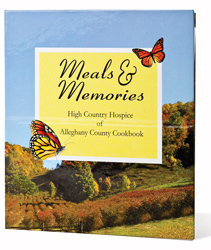 But knowing the cookbook also supports High Country Hospice of Alleghany County, which has been serving folks in Alleghany, Ashe, and Watauga counties since 1986, has made it a must-have for many. The hardbound cookbook raises funds for the nonprofit but also, through stories and photographs, preserves memories of people whom Hospice has served as well as volunteers who share their time and talents with the organization. To order a copy, contact High Country Hospice at (336) 372-4375 or pwagoner@hchealth.net.